ESPN Deportes+ is ESPN's live multi-screen spanish language sports network, a 24/7 destination that delivers thousands of streaming live broadcasts of global sports events annually, accessible online via ESPN3 and the WatchESPN service. 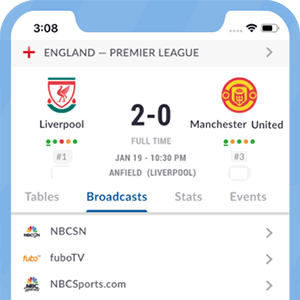 Launched in 2012, it offers exclusive live Spanish-language coverage of hundreds of sports events for the targeted Hispanic audience in the United States. Those include Major League Baseball, FIFA World Cup qualifiers, International Friendly matches, UEFA Champions League, European cup football and more. Subscribers of affiliated TV and Internet providers can access ESPN Deportes+ at no additional cost. Most of the programming aired on ESPN Deportes+ is also available on demand. *Got itLive Soccer TV does not provide ESPN Deportes+ USA live streaming. The information provided on this page is simply ESPN Deportes+ USA soccer TV schedule. ESPN and ESPN Deportes will each broadcast 15 matches per year in the US, while ESPN+ will exclusively show up to 10 live games in both English and Spanish. ESPN+ will broadcast nine matches live and on-demand per match-week, for a total of 340 Serie A matches per season. ESPN Networks will broadcast a Serie A TIM Match of the Week. Overall there will be about 40 matches per season on ESPN and ESPN2. Match of the week will be available on ESPN Deportes in Spanish. ESPN will share broadcast rights for MLS in the USA with Fox Sports and Univision Deportes. ESPN’s share will equal Fox Sports which includes a minimum of 34 live matches during each regular season, including a double-header every Sunday with games starting at 5pm and 7pm (ET). MLS Cups and All-Star Games will alternate between the ESPN and Fox Sports each year. More details Out-of-market matches on MLS Live and MLS Direct service are available on ESPN3 and WatchESPN. All Saturday matches will be available on this ESPN digital service. ESPN has acquired the multi-platform broadcasting rights of the Coppa Italia in the US territory. As per the rights agreement, ESPN+ will stream 24 Coppa Italia matches each year of the agreement. Coverage of the Coppa Italia in the USA will comment with the round-of-16 matches in January 2019 through the two-leg, semifinal series in February. More details The Coppa Italia Final and the Supercoppa Italiana will air live on the ESPN networks (ESPN, ESPN2 or ESPNEWS), in addition to ESPN Deportes’ live Spanish-language presentation of the matches. ESPN Networks has acquired the TV and Streaming broadcast rights for the SuperCoppa Italiana. In the agreement, the Coppa Italia Final and the Supercoppa Italiana will air live on the ESPN networks (ESPN, ESPN2 or ESPNEWS), in addition to ESPN Deportes’ live Spanish-language presentation of the matches.